Hi everyone! We are very excited to introduce a new feature here on the blog – it’s our Crafty Chat! We want to give you some fun, candid conversations with some of your favorite people in the papercrafting industry, and sort of a peek behind the curtain at what makes some bloggers and businesses tick. 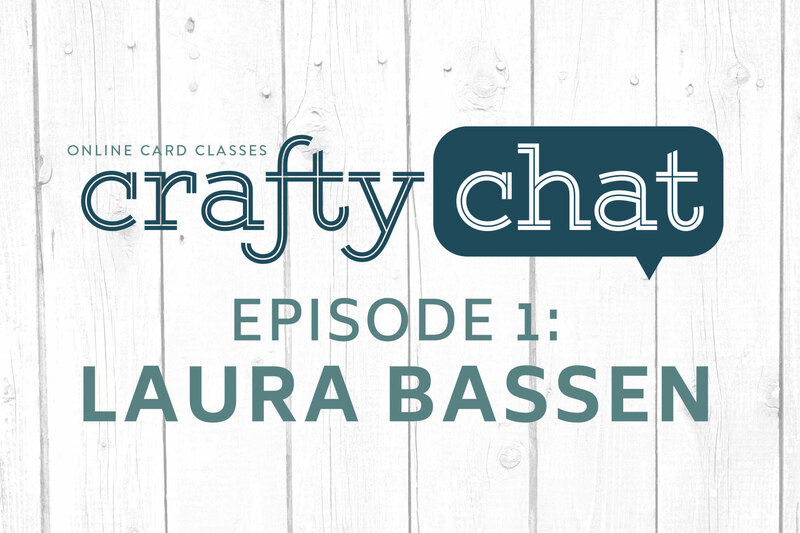 We are starting today with a frequent Online Card Classes contributor – Laura Bassen – talking about how to find and maintain your crafty comfort zone – that place where you feel confident that your skills can shine, and you can get to know and thrive in your own style. But she talks with candor about how to find inspiration while maintaining your own style, the importance of practice, and some great tips on knowing when to let go of something that isn’t working. There’s no mistakes in stamping, only opportunities to embellish. Loved this, thank you ladies. This is a really wonderful feature. I follow all of you and I enjoy your work very much. You are correct on so many of the issues that we go through to create a card or a scrapbook page. I have just arrived at a point where I am having fun just practicing different techniques and liking the fact that my work looks a little better each time. This is my therapy. What causes me stress is that I buy stuff and then I don’t use it right away. I look at the drawer full of new products and I cringe. Then I procrastinate and go do something else or go watch another youtube which will lead me to buy more stuff… Thank you so much. You are all lovely. OMG you mean I’m not the only one!! Me too! It is somewhat of a relief to hear I am not alone in this dreadful habit. Exactly, I see something someone does and love it and dropped on their blog and order. Then when it arrives I don’t remember who was using it. It’s crazy. Me too. I just discovered this chat. It and the comments are so helpful. Practice,practice,practice. I know how you feel! I buy so much that I don’t use because in the moment I see it used, I MUST have it and then it sits. I am trying to make myself use more of my stash and clean out or store what I don’t use. I store because I might decide to try it again someday. WOW ! you all just got to me. Practice should be fun…not pain. I will start tomorrow and not worry so much about the finished product but the trip that got me there. Very freeing information. Thanks! I enjoyed listening to your thoughts on style. I am looking forward to more of these ‘chats’ in the future. Really enjoyed listening to all these great card makers.Looking forward to the next one.Thank you Ladies. So uplifting! I thought I was the only person who stewed over creating a card. Always I have viewed your cards and just know you have whip them out. What a super fun chat! I always say the same thing I learned from Jennifer – “It’s handmade, not Hallmark”. Enjoyed listening to the four women share their process and thoughts on card making. Hope there will be many more ‘chats’ in the future. Oh this video is sooo awesome!!! I feel like I’m there amidst you all, listening to your carefree chatter!! What a great video. I watch all of your blogs and copy many of the cards you make (lots of mistakes along the way) but I have so much fun playing. Love this feature! Getting to more about each of you is inspiration within itself. I always enjoy each of your videos. Thanks for taking the time to “chat”! Wow… this was awesome I love he realness form each of you. I just love all of you ladies and I do follow and look at all of your blogs. I appreciate all of the techniques and ideas from each of you keep up the amazing work. loved the chat, felt like I was there with you – giggling and enjoying each other. This is a fun feature. I have a question maybe someone can answer. Both Jennifer and Laura mentioned a blog reader site. It sounded like feedaread. Is that correct? Also, if it isn’t correct is there a site out there that would help me organize my favorite blogs to read so I don’t have to keep searching for them? This is a wonderful video. So much of what you all said is how I feel about stamping and my work. Thank you! That was fun and interesting to watch!! You all are awesome! Wow! What a great reminder to us ‘followers’ that you ‘creative goddesses’ are actually real people too. This video clip has put so much into perspective for me! Congratulations on your new website, Kristina and Jen and I look forward to the many therapy sessions ahead!!! Love you all! I love Laura’s attitude and style. And I totally agree that practicing is more important than talent. Talent without perseverance will never shine. I totally enjoyed listening to this. Good tips – I am an overthinker. I read alot of blogs just so I won’t miss anything, always inspired by color choices (thanks, Laura) and techniques (thanks, Jennifer) and element placement (thanks, Kristina). This is a great feature. Looking forward to more. This was brilliant! Please keep this feature coming. It is inspiring to be reminded that our cardmaking Goddesses don’t always get it right the first time and that they, too, sometimes struggle to find inspiration. To see you all having a girlfriend chat like this also reminds us that you are not just a perfect video posted once per week, but girls having fun….just like us. Cheers! This was an awesome Crafty Chat! Loved hearing and seeing all of you talk about your process of crafting cards. Nice! Looking forward to the next one. Fun video and I could watch you ladies chat all day. I so much love all of your styles and comfort with creating! Thanks for this! Loved this! I think I’ve earned a PHD too, but mine is in overthinking everything! It was heartwarming to find that I’m in good company! I really enjoyed having my morning coffee with you sweet girls…hugs to all! Delightful addition to website. It’s great getting to know the crafters we admire so much. Thanks for sharing your ideas. Right On with video chat. Your new web site is welcoming and a draw visually. IT FEELS LIKE JENNIFER AND KRISTINE IN THE DESIGN. IT IS GOING TO BE HOME AWAY FROM HOME FOR ME. LOVE BLOGS, BUT THEY OVERWHELM ME, YET THE INSPIRATION THEY GIVE KEEP ME COMING BACK. THE VIDEO CHAT IS A WAY TO LET US KNOW YOU, SEE YOU AND LISTEN IN A DIFFERENT WAY THAN CARD MAKING VIDEO. I love listening to you and what you had to say. It felt very freeing to hear that it’s not instantaneous to turn out what practice could produce and its ok to just have fun messing around. With time we may even have it get better but in the meantime it’s creative and play. Thank you and please do it again soon! I loved watching the chat. I love that you all have struggles with card making and how you overcome the days when your creativity is not there. I also like the idea of practice as I don’t do this and get discouraged with myself when a technique doesn’t work and I only tried the technique one time. I follow all your blogs and they sure do inspire me. Thank you for sharing. Love your chat!! What fun and what an inspiration you all are. Love ya and appreciate your humanness!! Such fun! So validating! Thanks for this great feature. LOVE THIS FEATURE. Thank you all so much for your candor about the process of creating. Sometimes I am not patient enough with myself. I am going to try and remember that practice can be more like “playing” and that that is so much fun, when I get out of my own way. One more thing, LAURA WAKE UP! Every time I see an image of you I think to myself, how BEAUTIFUL that girl is! Rediscover the mirror, and appreciate how lovely you are! Thank you all for teaching me so much about crafting!! I am having so much fun! Off to sign up for the next class ~ I can’t wait until it starts!!! Love this new Crafty Chat feature! Looking forward to more! Thank you. Fun chat! When you mentioned not liking something you made, it made me think of an exhibit I am involved with featuring beads. I was told that some cultures make a mistake, ON PURPOSE, because no one is perfect. I loved that idea. I am not perfect, so my cards dont have to be! Can I just say I LOVE this type of video. It allows us to see the personalities behind the cards :) This feature will be a great addition to Online Card Classes. Thank you for this fun feature. It was so nice to see and listen to conversation. It was almost like being there. I am glad to hear Jennifer does not really depend on blogs for inspiration. I find myself intimidated by all the different designs. I have never tried instagram but check in pinterest for layout ideas. Your new site is wonderful. Looking forward to the next class. I look at my mistakes as a way to get creative in covering them up…..the recipient I hope just enjoys getting the card. If they smile then I have been successful. I thoroughly enjoyed this chat! I’m relatively new to card making, mixed media, etc. and have just found this site. This was the most refreshing chat eva! I love how you all have different ways of inspiration and finding your own style/comfort zone. I love it ALL and am struggling to just kind of zone in on a few things at a time! lol Loved the ‘you just need to practice’ statements. That’s true! I need to quit organizing all those wonderful things I’ve bought and actually use them and practice them! Thanks again, ladies. I look forward to future chats! So much fun to listen to you chat, share and laugh. I loved it! It’s great to realize that you have ups and downs too in the creative process. I’m with Jennifer, the more I look at blogs, the less I seem to stamp. Somehow it saps my own creativity. Blogs that teach me things like your classes are fabulous! This feature is the best! Thank you for all the inspiration. Wow! Great feature. Practice is allowed! I never think about that concept in regards to card making. Thanks for the wonderful chat and words of encouragement. I like being reminded that paper has two sides and we are not Hallmark. I am so glad I spent part of my day with you. Love, love, love! I now realize that although I follow a few blogs, I’m really looking for the videos. There are a couple of blogs that I actually read (not kissing up, but they actually are Jennifer’s, Laura’s and Kristina’s), but I just love watching and listening as people create. I understand about getting to know your comfort zone or style when creating a card. I just made one that was totally out of my zone, and I felt it every second I was creating! My style is usually CAS, & I like it that way. I so enjoyed this crafty chat video! Please keep them coming! It’s so nice to know that I am not the only one that is critical of her work! LOL! Great video! That was FUN!! I am one of those who finds blogs inspiring but learned the hard way that they were eating up precious creative time. I had to make a conscious choice to choose Making over reading about making. You might be interested to know that the 4 blogs I do follow closely are Kristina, Laura, Jennifer and Debby Hughes. Seriously, the fab four! I loved this chat. I started watching in my pj’s with one eye open. Now I am wide awake and smiling. Thank you for sharing. Awesome chat ladies! Loving this new feature! Loved this! Thank you for this site. I got started in February, 2016, and I’m addicted. Packages arrive everyday. My grandchildren come over after school and help me open mail and organize. What a fun time we are having together and I LOVE making cards! I watched hundreds of hours of all of your YouTube videos and have learned so much. I am homebound right now taking care of my 84 year old father who has dementia. I can’t leave him alone for more than 5 minutes, so my crafting spot is in the family room where he is. It has giving me something to do because he can’t have me out of his sight and as it turns out, I love it. I loved this video discussion because so many things all you ladies said ring true to me as a crafter and cardmaker. I can be hard on myself when making or coming up with a card design, but what Jennifer says is on the button: enjoy the create process and make someone happy by sending them one of your handmade cards. Thanks! All of you inspire me. Noooooo… I didn’t want that to end! I can sit here & listen to you ladies all day. I felt like I was in that chat with you. That was fun. You ladies are my inspiration!! I love your work, I love the new website, it’s so very user friendly now. I’ve done quite a few classes with you now and you never disappoint. Thank you for taking the time to make these amazing classes. I’m sure you ladies are beyond busy. So I just want to say thanks!! I think you captured it Jennifer as a crafter we should find some enjoyment in what we do. If we are not finding joy or having fun with copics or some other medium….let it go and use the time to practice mediums we really enjoy or explore a medium we have not had time for before. What a wonderful new feature! Thanks so much, ladies, for letting us eavesdrop on your conversation. The two confessions that hit home were: 1) asking hubby which card he prefers and choosing the other one and 2) remembering that I would always ask myself “What would Sandy (Allnock) do when I first started making cards. I really enjoyed this new feature and learned a lot from you all. Thank you! what a great and inspiring addition to your classes! Really enjoyed listening to you all, and I read ALL your blogs! Absolutely love the CraftyChat. Thank you! That was a lot of fun! I love hearing from all of you that some things get scrapped and your mojo isn’t always there. Also once in awhile I ask my husband and son for their opinions. As far as practicing I am finally getting to the point where sometimes I do just play around instead thinking this must become a card. Thanks so much. How fun! Just “found” this today and I adore Laura! So fun and great seeing you all “chiming” in! Love it!! This was great! Loved hearing Laura’s story and her tips, but also loved seeing the three of you chatting about the process of creating. So enjoyable – and I can commiserate with Kristina on the “down time” needed after a creative spurt…tho I think I have far more “down” than “up”! Thank you all for making these videos, I shall look forward to and treasure every one! This was wonderful! You covered so many issues I’ve had as a card maker and as a teacher (in our local craft store). Oh my, the insecurities I have felt over the years! Thanks so much for sharing, this was a real blessing! I feel Lydia did a superb job as moderator for these first conversations. I am glad that Jennifer and Kristina selected another person for this role. I hope we see more written description on her artistic experience and talents. I have enjoyed all she has shared in hosting the Mix-ability Challenges at Splitcoaststampers. Love Laura Bassen! I’ve been following her blog for some time. Her personality is so bright and cheerful and it is reflected in the cards she makes. This chat session is as valuable as the online classes! I was very encouraged and learned a lot! Thank you! This was so fun and so exciting and so different. I started making cards when I was 8. I can remember making a 3D flower with tissue paper and glue. But my eventual “gateway drug” into this addiction was also S.U.! I really liked hearing everyones artistic path- it was great to get some perspective on where I am. Even though it is just a free time indulgence at this point. I love that I can “just leave it” for days, months or even years, and then come back to a piece of background or embellishment, and it is “just right”. I could go on forever. Thank you ladies for all you provide – you are a great inspiration to many!! except I know I am gwtting know-how all the time by reading sucxh nice content. This is SUCH a great thing to do – just sit and chat and let us eavesdrop! It was startling to hear that you all have confidence issues in your creations at times. It’s comforting to know even the pros don’t wake up, video 3 perfect cards and then cook dinner. Thanks so much and I hope this continues. I just want to thank all you ladies for these Chat videos…..they are simply amazing in so many ways! I cannot emphasize how much I have learned from all of you, not only about how you get your inspiration but some of the highs and lows creators go through. I hold each and every one of you ladies who have participated in these Chats in the highest regard! As a card maker who has only been at it for under 2 years, and who is craving for more knowledge to hopefully get to a point where I can design my own cards, I wanted to add that after watching hundreds and hundreds of YT tutorials, that I’ve taken just as much out of these Chats both creatively and emotionally. God bless ladies and keep up the great work you all share! This is a great new section! I love it! I was wondering how I spell the surname of the Christina that Laura mentions in this video as being an inspiration. I am sure I have seen her work, but I wanted to check, and I cant check without the correct spelling. TIA. Loved this video! I went exploring some of the sites listed while listening and then I would hear something that would make me go – oops, that’s me! I am one who wants to be perfect with a new technique right now! I’m a video explorer and when I see a card I would love to CASE, I look for a video and that’s why I’m am addicted to Jennifer McGuire! Thanks for inspiring me and encouraging me to have fun PRACTICING! Loved the video, its great to know that all of you think the same things I do and that you critics of your work too!! It is nice to know that you all our human just like the rest of us. I love all of your cards!! This was so much fun to view, thanks! Loved this…..great to know my ‘idols’ go through the same things I do! Practice, practice, practice! Ohh myy!, I just found this chat, now thatI am taking Tim Holtz Creative Chemistry and loviing it!! I loved how opened you were about your cardmaking, your results, your flaws, it was very inspirational! I follow all your blogs, videos, it is just part of my day!! Thank you!! My first visit to the new site as well. Christina, you did a marvelous job with it! I don’t know which one of you came up with the brilliant idea of doing ‘Crafty Chat’ but kudos to all! The title reminds me a little of the old Saturday Night Live show, ‘Coffee Talk’ anyone remember that? Great information passed along in a fun, informal way that makes one feel we’re right there with you. Wonderful series! Um, I just found this little gem after hearing “crafty chat” twice today. I love! I feel like I just enjoyed a cup of coffee with soulmates. I hope this feature continues. You are all joymakers! So interesting to listen to! I think the reason OCC is such a success is that we can take the ideas and apply or adapt them to the products and tools that we have without having to go out and purchase something new or the same as what you are using to demonstrate. My friends and I often say “every card does not have to be an art project” Some can be simple and beautiful. Thanks for this fun Chat. This is great! Just heard about this blog from Kristina and had to stop in. I know I’m going to be watching all these videos in the next few days. You ladies are so helpful and inspirational, knowing that y’all go through the same things that I do is so helpful. I have a crafting studio with a couple friends and one of the things I tell my crafters is that there are no mistakes in crafting, only chances to be more creative and I hold to that. Thanks for another wonderful blog to follow, I’m one of the people who get inspiration from blogs. Well I’m late to the party but really enjoyed it. It’s good to hear the pros say they have “those moments”, too. I like to visit blogs to see and learn techniques to use for something I make. It won’t ever be a copy, I haven’t even made a card in a class that was like the original example, always what worked for me. Laura is one of those people I watch just to hear her little stories. Of course, her work is amazing, as is the work of Jennifer and Kristina and several others, but I learn a little bit from everyone and buy too much stuff. Wow! I’ve been in a crafting rut for a while. Even chatted about this issue this morning. Came home and my friend Dayna had shared the link to this. Perfect timing! I’m trying to get out of the rut. I’ve signed up for Scrapbook Expo card swap in a month and need to get 16 cards done. I’m taking this one step at a time. I’ve pulled the stamps and bought the background paper. Now to put Memento to the stamp and Neenah because Copic coloring takes time. Thank you for sharing this. I just love you ladies! I follow all of you and I have gotten so much inspiration from you. I am a beginning card maker and I have watched your videos over and over trying to find my style. I’ve decided that it’s okay not to have a style, yet. I have made lots and lots of mistakes, but perseverance is my middle name (I’m a martial artist) and I’ve actually turned out a few pretty good cards! Anyway, I just wanted to say thank you all from the bottom of my heart and I won’t let my inner perfectionist get the best of me! Thank you so much for doing this type of video. I just came upon them and am having fun watching. I love this video. I agree with Jennifer-instead of watching a video on youtube or reading a lengthy blog, I would rather see a quick picture of a card to get ideas. Less time consuming! I love all of you ladies-super woman! I’m a “newbie” here; looking forward to participating in hopes of getting some ideas. This is terrific…I think Laura’s golden charm is her sense of humor. Thank you for affirming our secrets, fears and passions. Laura – I can so understand those moments of insecurity when creating. I think that is actually part of the process. I would especially think that would be true when you do creative work for a living. When you are stuck, I think you are reaching deep inside and getting into a whole new creative spot. It’s growth! Love all of you guys and love your influence. Loved this! Laura one of the things I love is when you are looking critically at one of your designs and questioning some aspect – e.g., do I need another bee? That reflection really teaches about design and helps me because I decide and sometimes I’m with you and sometimes I’m not. Regardless I am more aware of some design aspect and that is a gift! Bit most of all I love and appreciate that you come across as human and irreverent (in the BEST way)! I’m late starting with this, however it is interesting to read how many of us procrastinate AND like to start new projects. I love these Crafty Chats. This one was so encouraging… there was so much I took away from you ladies. The reminder that the practice is part of the fun was what I needed to hear. I think I will post that on the wall of my up and coming craft room. Blessings! Loved this honest chat. It made me think more deeply about my own personal style, comfort zone, and inspiration modes. Thank you! Loved listening to all of you! How insightful! Thank you so much! Loved the chat! Since I’ve always been a bit of a perfectionist, I needed to hear that the reason my cards don’t look as perfect as yours is that I haven’t had nearly as much experience or practice as those of you who share your talent and expertise. And I’ve always loved Jennifer’s saying … ‘It’s handmade, not Hallmark’!